For fourteen-year-old Chloe, planet hopping is a gift. Righting the wrongs of the multiverse on behalf of a mysterious life form is a privilege. Leading a double life has its perks. Being Earth-born, however, simply bites. Chloe knows she will never fit in when high school starts; that’s a given. It’s not like she can reveal her true self and her unusual abilities on Earth anyway. She used to be okay with that, as long as her two best friends were part of her extraterrestrial life, understanding her the way nobody else could. That was before those friends vanished. That was before some jerk displayed her underwear on his head. Now two-thirds short of feeling whole, Chloe becomes an enemy to herself just as a terrifying nemesis threatens to resurface. Can she fight through weakened skills, fearsome flashbacks, and evolving relationships to meet her future head on? Does it really matter what world you’re on when trying to find yourself? 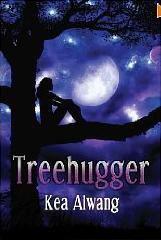 Treehugger by Kea Alwang is a sci-fi, fantasy type young adult adventure. The beginning few chapters kept me intrigued but a bit confused. As with most fantasy books or movies, it takes a bit to get used to the author's descriptions of worlds, characters, and language. Some of the names were difficult to figure out, but I think that added to the fantasy/sci-fi aspect of the story. It is futuristic in that there are multiple galaxies, worlds, humanoid and non-humanoid type creatures and more. As I read I got a nostalgic Star Wars type feeling for the ambiance of the different worlds. I enjoyed reading of the strong relationship of the three main characters, but I felt that Chloe was a bit of a brat throughout most of the book. She had such a "poor me" type attitude that I got a bit fed up with her after a while. Her attitude makes her character more realistic and believable, so I'll forgive her for being a bit of a brat. I think most fantasy and sci-fi fans will enjoy this book. Anyone who likes a good adventure will enjoy it as well. Chloe's struggles to fit in, her disappointment and frustration of missing her close friends, her determination to help when needed and her tenacity for getting in difficult situations makes her a believable character. I look forward to reading more by author Kea Alwang. *I received a free copy of this book for my review. All reviews are my personal, honest opinion.